I understand the need for confidentiality, communication, and preparation for each case I agree to handle. I take my work and obligations very seriously while seeking the best result for each client. A conviction in a Virginia Court is rarely, if ever, removed from one's record. Any conviction may impact one's freedom and future employment opportunities. 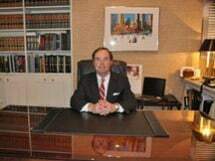 John W. Luxton, P.C., provides legal counsel for clients in Richmond, Charlottesville, Norfolk, Colonial Heights, Hopewell, Harrisonburg, Petersburg, Henrico County, Chesterfield County, Hanover County, Goochland County, Albemarle County, Amelia County, Caroline County, Charles City County, Dinwiddie County, Montgomery County, New Kent County, Powhatan County, Prince Edward County and Prince George County, Virginia.